BLOODHUNTER, Silverlight book #1 was released yesterday and is available now on Amazon! Check out the reviews on Amazon and Goodreads! I think you'll like this new dark urban fantasy. Book 2 in progress. First he tried to kill her. Now he's obsessed with her. Six years ago Trinity Sinclair was the victim of a brutal vampire attack. The assault changed her into something she has only recently begun to understand, and connects her in unimaginable ways to her attacker. But the dominating vampire who attacked her doesn't want to kill her. He wants to keep her alive. Unfortunately, keeping Trinity alive won't be easy when nearly every vampire in existence wants her dead. As a Bloodhunter, she is one of the very few humans in the world who can give a vampire his true death--and there is nothing worse or more terrifying to a vampire than true death. Luckily for Trinity, she doesn't have to fight alone. 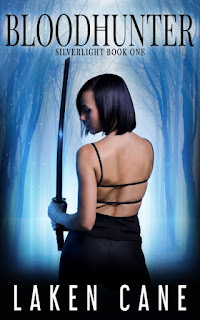 She has a special sword and six protective people at her back-- The vampire master who attacked her, a mysterious hunter, and four incredible--and hot--supernaturals. And she is as passionately drawn to them as they are to her--emotionally and physically. Her unquenchable thirst for blood is matched by a primal, undeniable lust, and Trinity realizes she is in more danger of losing her heart and soul than she ever was of losing her life.